What is your relationship with research? Conducting research can be richly rewarding in terms of career development, institutional enrichment, and understanding the needs and pressures of library users. Many librarians and information professionals have a dual role with respect to research: leading their own research/participating as part of a research team, and advising other researchers on achieving research impact. 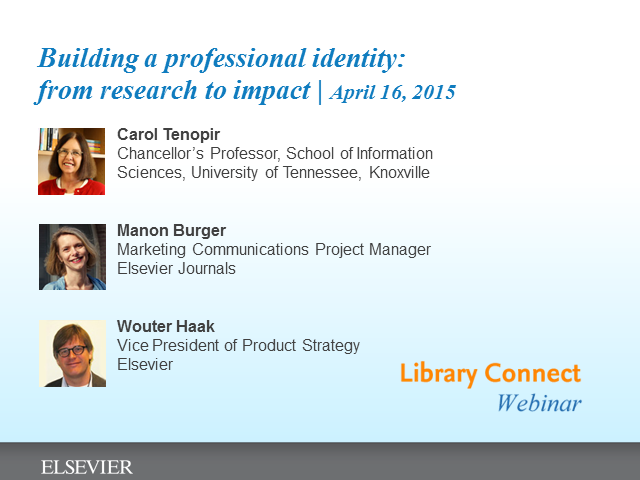 Join our webinar presenters as they explore three critical facets of managing a research career and reputation. Eminent LIS scholar Carol Tenopir will begin with a presentation based on the new Library Connect ebooklet Librarians Do Research Too! She will outline an easy-to-follow blueprint for LIS professionals to begin their own research projects. Manon Burger will then describe how to prepare and promote articles to increase their visibility and attract readers. Wouter Haak concludes with information on measuring research impact via My Research Dashboard, a new service being rolled out to Elsevier authors that includes metrics, such as citations, usage, views, scholarly mentions and more. Would you like to explore opportunities to evolve or shape new library services based on quantitative data? Join us for a presentation of the Ithaka S+R Faculty Survey. The presenters will share insights into faculty research, teaching and publishing practices, and ideas for how librarians could incorporate this knowledge into the design of programs and services. In the 2018 survey cycle, Ithaka S+R expanded coverage of new issues including learning analytics, open educational resources, and evolving scholarly communication models. The Ithaka S+R US Faculty Survey has tracked the changing research, teaching and publishing practices of higher education faculty members and perception of the role of the library since 2000.